Wing span: 2 1/4 - 3 1/8 inches (5.7 - 8 cm). Identification: Upper surface of male is lemon yellow with no markings. 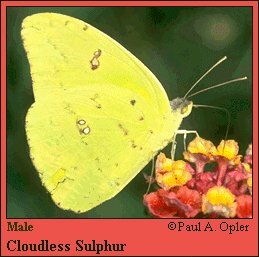 Female is yellow or white; outer edges of both wings with irregular black borders; upper forewing with dark spot in cell. Lower surface of hindwing of both sexes with 2 pink-edged silver spots. Life history: Males patrol with rapid flight, searching for receptive females. Eggs are laid singly on young leaves or flower buds of host plants; caterpillars eat leaves and rest on underside of leaf petioles. Flight: Many flights year around in the Deep South; may have one flight in late summer in other southern states; immigrants to northern states in August or September usually do not reproduce. Adult food: Nectar from many different flowers with long tubes including cordia, bougainvilla, cardinal flower, hibiscus, lantana, and wild morning glory. Habitat: Disturbed open areas including parks, yards, gardens, beaches, road edges, abandoned fields, scrub. Range: Permanent resident from Argentina north to southern Texas and the Deep South. Regular visitor and occasional colonist in most of the eastern United States and the Southwest.